The development of Internet technology makes people like Internet addiction, if not online it seems there is less. Therefore to meet these needs in some public areas such as airports, stations, malls, and so often provide free internet service to its visitors. As a network admin in the office, at the store or at school for example you also want to apply the same system, you can provide Free services to visitors, guests or even for students at school. Usually in this Indonesian society if there is something that is Frequent is often the best seller or will many people who want to use. As a Network Admin we must be wise in dividing the bandwidth, we must do the management so that Bandwidth is fixed on their respective portions. Especially for a free service, it should be a user who uses Free access given limitation, can be based on time, Quota even we can also provide ads or we show company profile before the user free access the internet. 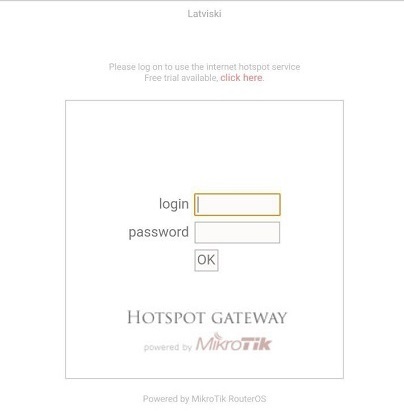 Hotspot on mikrotik has Trial feature, which can be used to give Free Internet access to customers without us giving username and password. Customers do not need to enter a username and password just click the button on the first portal when connected with our wireless AP. 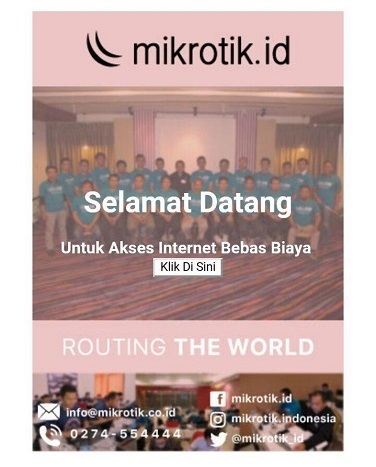 In the first portal we can edit from the default congenital mikrotik be our company profile for example or we put a picture of the product along with the price of our products. 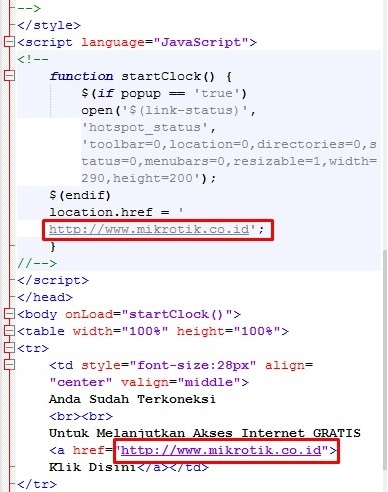 The basic configuration of Hotspot can be learned in the article Basic Settings of Mikrotik Hotspot Before giving free access to the client that needs to be done first is to provide bandwidth limitation so that free client does not interfere or even spend the bandwidth in the office. Better to use PCQ configuration for free client bandwidth divided equally. 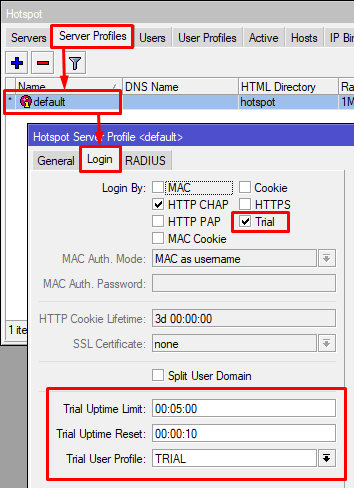 Next create a User Profile on Hotspot to provide trial access or free access. Determine the shared user as needed and un-check the Add Mac Cookie parameter so that if the client has logout or run out of quota and time must click again the first page login page. User Profile is in the menu IP >> Hotspot >> User Profiles >> Add. Do not forget to point the queue parent to the previously created Simple Queue. Please go to the Queue tab. The configuration of the profile server must be changed so that the hotspot mikrotik Trial feature is enabled. 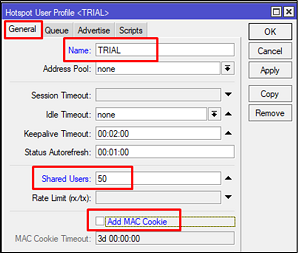 How to enable it simply by checking the Trial parameter in Server Profile in the Login tab. From the server profile we can limit the online time for free client example 5 minutes only. then Point the user profile to the Trial user profile created. Trial configuration is complete, can be tried by connecting hp or laptop device to hotspot interface. In addition to time and speed limitations can also be dilimit based on quotas. To give a limitation qouta is on Hotspot User. With just a click, it is no longer need to create a username and password again to the client who wants to access the internet for free. For the purpose of advertising the company or selling the product can also after click the button we navigate to our company website or online store first. We just need to edit it in alogin.html hotspot file. 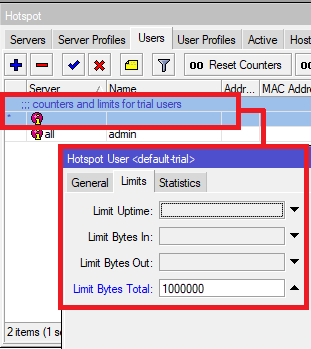 With Trial Hotspot Feature that exist in mikrotik hotspot can be custom in accordance with the needs of the field.